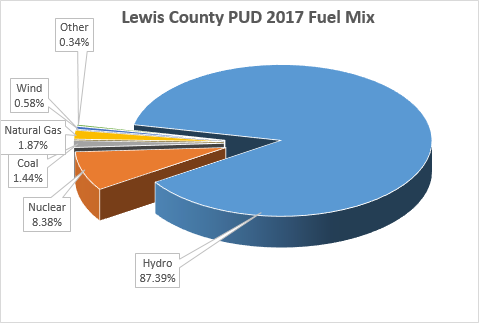 Each year Lewis County PUD, along with all other electric utilities in Washington State, is required to publish a report of the types of generation used for its electric supply. 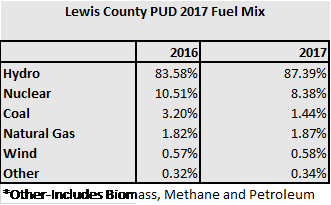 This fuel mix report identifies the types of generation used for the electricity we provide to our customers. Electricity can be generated in many different ways: water, wind, solar, nuclear, coal, natural gas, steam, methane, petroleum, and plant waste. As you can see from the information below, the majority of the power we purchase comes from various hydroelectric sources throughout the Northwest. (a) For an electricity product comprised entirely of declared resources, a retail supplier shall disclose the fuel mix for the electricity product based on the quantity of electric generation from those declared resources for the previous calendar year and any adjustment, if taken, available under subsection (6) of this section. (b) For an electricity product comprised of no declared resources, a retail supplier shall report the fuel mix for the electricity product as the fuel mix of net system power for the previous calendar year, as determined by the electricity information coordinator under RCW 19.29A.080.